The Titanic sank in the North Atlantic Ocean roughly 400 miles (that's 640 km) southeast of the coast of Newfoundland. 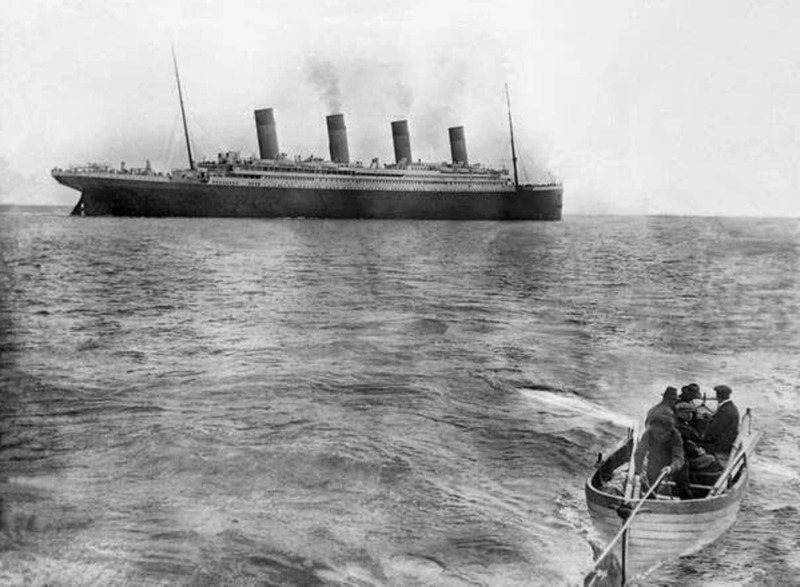 The bow of the ship was found at 41°43'57" N, 49°56'49" W and the stern was located at 41°43'35" N, 49°56'54" W.
The last known photo of RMS Titanic taken on its maiden voyage April 12, 1912. Only three days later, the ship would collide with an iceberg, with over 1,500 passengers (including the captain) perishing. 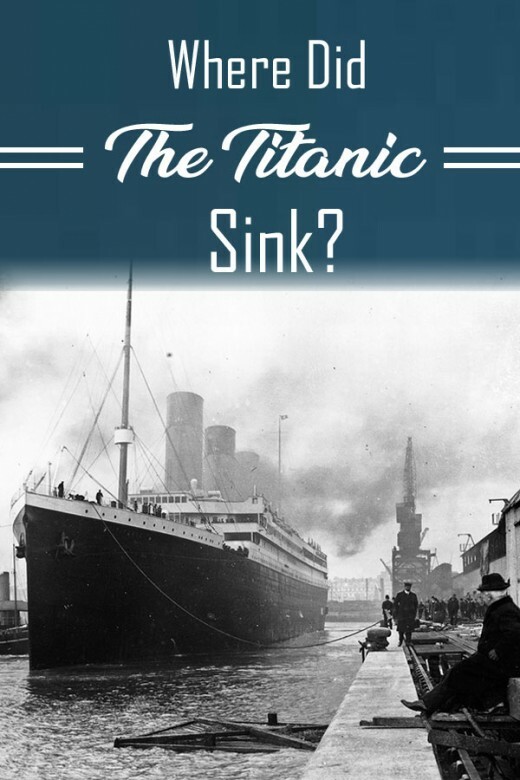 It's well-known that the Titanic sank as a result of a collision with an iceberg1, but what you might not know is where it sank. Where did it sink in relation to her last port of call? What was her last port of call? Where was the Titanic headed? How far from her destination was the Titanic? 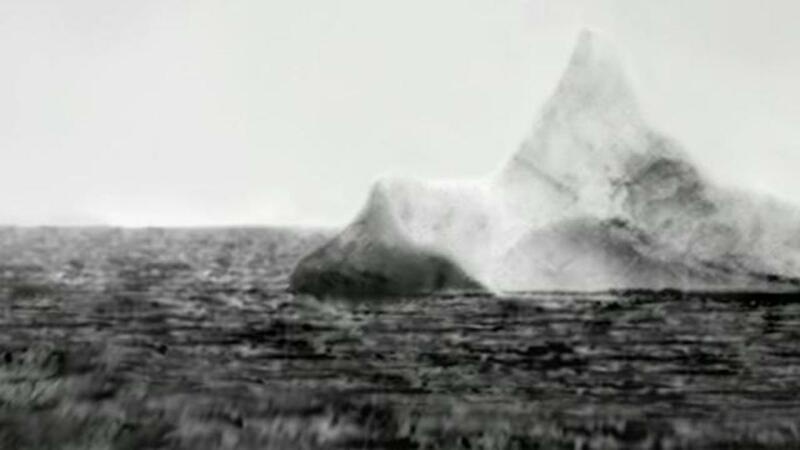 Photos of icebergs found on April 15, 1912, close to where the Titanic sank. A red streak of paint scraped along the base of one, serves as an indication that it had collided with a vessel within the previous 12 hours. As the Titanic was sinking, the bow and stern separated due to the structural stress placed on the ship. 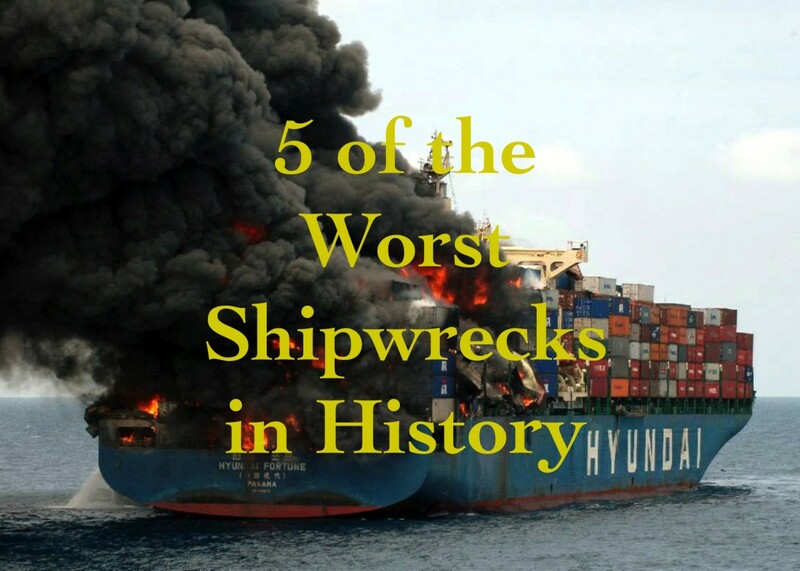 This caused the contents of the ship to be strewn across the ocean floor in a debris field spanning roughly 2000 feet. The bow of the Titanic, which is the larger section of the wreckage, was found at 41°43'57" N, 49°56'49" W. The ship's stern was located at 41°43'35" N, 49°56'54" W. The final resting place for the ship's boilers is at 41°43'32" N, 49°56'49" W.
The Titanic made her final distress call from 41°46'N, 50° 14'. These coordinates show there is a fairly wide sprawl of the wreckage. Where Was the Titanic Going? 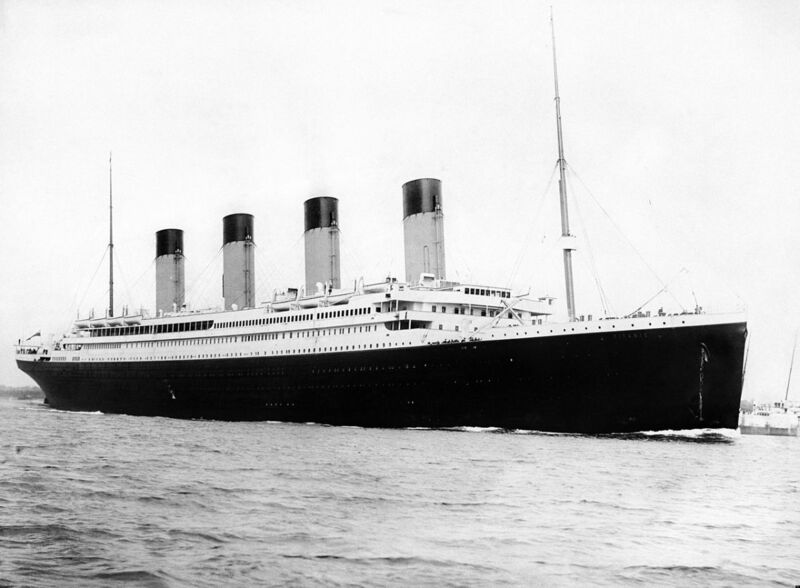 The Titanic started her journey in Southampton, England and headed toward Cherbourg, France. From Cherbourg, the Titanic sailed to Queenstown/Cobh, Ireland. After leaving her final port of call of Cobh, Ireland, the Titanic made her maiden voyage across the Atlantic set to arrive in New York. The ill-fated voyage across the icy waters ended approximately 1000 miles from New York. 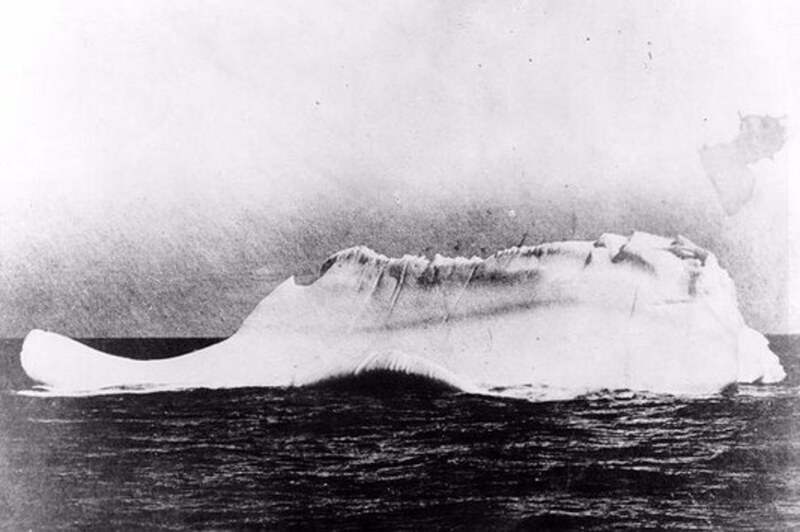 However, the Titanic was only within hours of the Lightship Ambrose and only about 375 miles due south of Newfoundland when she had her fateful rendezvous with drifting ice. The Titanic embarking on her maiden voyage. Photo taken April 10, 1912. How Deep is the Titanic Wreckage? The Titanic currently rests in mud and sediment on the ocean floor, approximately 12,415 feet (2.35 miles) below the waves. That's really deep! The pressure at this depth, paired with the frigid temperatures, makes any exploration and excavation very difficult, not to mention expensive! While freezing cold temperatures have, to some extent, helped preserve the Titanic, she is starting to decay and fall apart. Roofs have started to cave-in, decks are becoming weaker, and the stern may even collapse. Because of this, many deep-sea expedition teams are doing what they can to preserve the ship. Currently, the ship is undergoing sonar mapping which will be used to form a 3D replica of the wreckage. This replica will be used by scientists in order to better study the ship. Perhaps someday, we will have the technology to bring both the bow and stern of the Titanic to the surface. Currently, many objects from the ship, including coal, metal, dishes, and items owned by the ship's passengers are being brought to the surface. Imagine being able to see the ship in its entirety! Official investigation report - the sinking of RMS Titanic (PDF) (1 ed.). London: The final board of inquiry. Retrieved 4 Feb 2018. Ballard, Robert D. (1987). The Discovery of the Titanic. New York: Warner Books. Ballard, Robert D.; Hively, Will (2002). The Eternal Darkness: A Personal History of Deep-Sea Exploration. 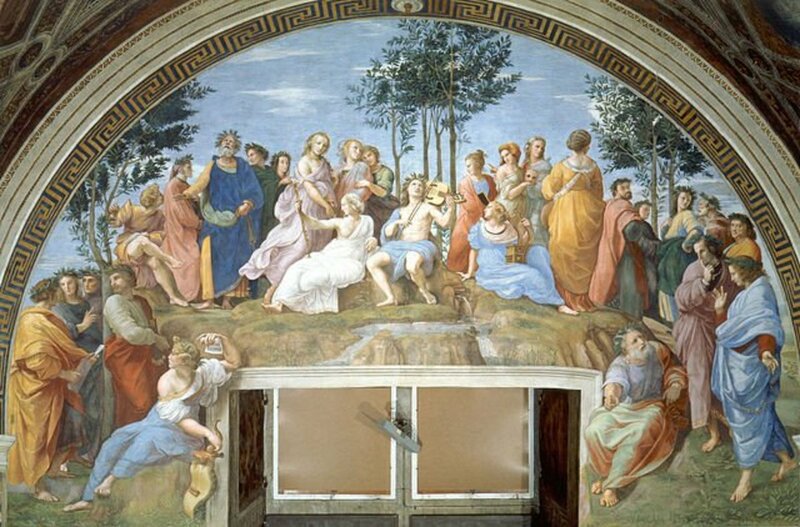 Princeton, NJ: Princeton University Press. "Titanic Ship Listing". Chris' Cunard Page. Retrieved 4 Feb 2018. Where is the Titanic now? 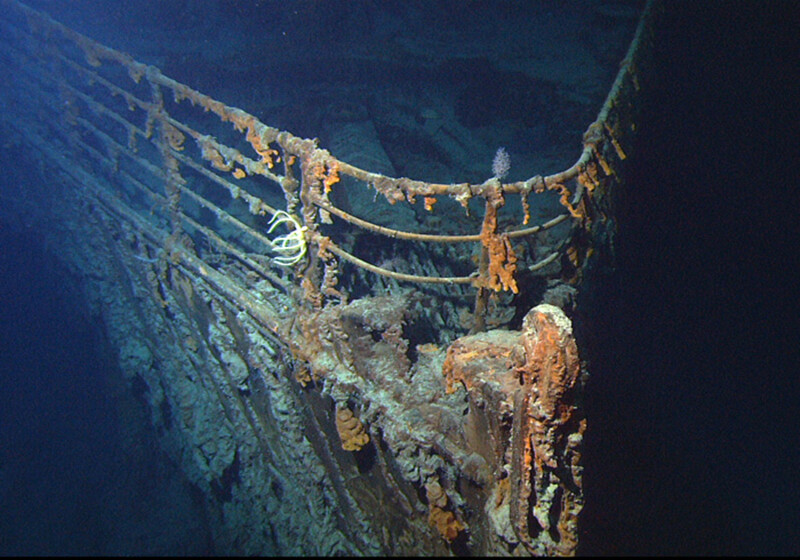 The Titanic is still at the bottom of the ocean, in its final resting place. Whatever Happened to Olympic, Titanic's Sister? I know, all about-the, RMS Titanic. I read books, about it, & I own, lots of, Titanic DVDs, books, & I, own the, 1997 movie, on video, & DVD, I also, saw the, Titanic musical, way back in, the year 2000. I really liked, reading this, Titanic article. It is, very interesting, reading about, the RMS Titanic. @Shubb Baronsdale - Are you a Scot by any chance? Nothing indicates the folly of the English better than the sinking of this great ship. All the cockeyed, goofy, stupid, dishonest features of the Englishman's detestable personality played their part in the disaster, from the refusal to slow down despite repeated warnings from other ships of the presence of pack ice on the steamer track to the failure to provide the ship's lookouts with binoculars. Was this something unique? No indeed: The same pathetic folly would be repeated by the English—and imitated by their toadies the Americans— in WWI, in the Treaty of Versailles, and in WWII, costing Britain the loss of her Empire, the preservation of Soviet Communism and the creation of Russia as a world power, and the descent over Eastern Europe of the Iron Curtain. What a wretched bunch of incompetent, deluded, misguided scoundrels for a people the British Isles have! Very interesting article! There was a lot of information that I didn't know! I love reading stuff about the Titanic, i don't know what it is about it, just has always fascinated me. Interesting article. This is a very interesting hub. As for the question of why the ship rests 13 miles from the last point of radio communication I think is because given the depth of the ocean there, 13000+ feet the parts of the ship would have drifted with the prevailing currents many miles on the way down to the bottom. Very interesting hub! I thought I knew everything there is to know about the Titanic since I was actually one of those teens who saw the movie X amount of time at the movie theater (too embarrassed to disclose the number, lol!) and then I read books about it and my family and I happened to go on a cruise the following summer up north where one of the stops was in Halifax, so of course I explored the Titanic exhibition and went to the cemetery, amazed to have found a grave belonging to a Jack Dawson. I didn't know though that the ship made stops in France and Ireland before heading to NY. I recently heard that an exact replica of the Titanic is being built and will set sail in 2016! Thanks for publishing another well-researched, well-written Hub. I've read other articles about the disaster, but I learned some new things from your Hub. my family visited athe naval museum in Halifax where there is a rather extensive Titanic exhibit. 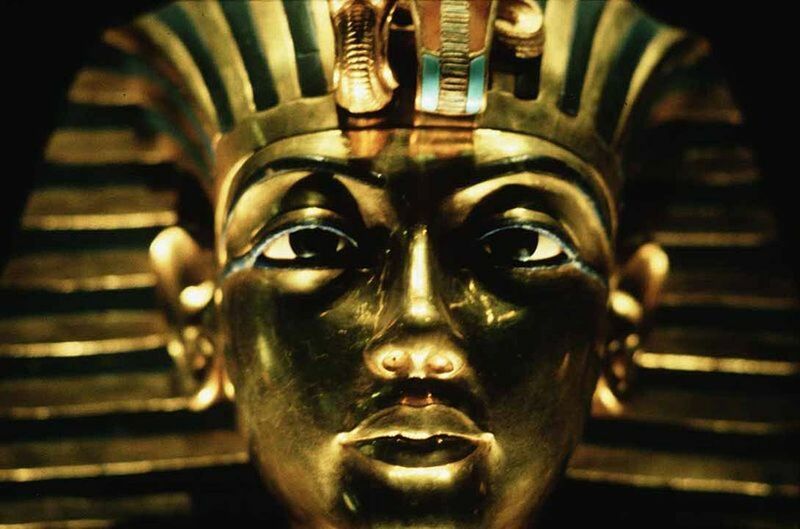 it was amazing and extremely icompelling. One of the cemeteries in Halifax was the burial site for many of the victims including an unidentified infant who still receives mementoes laid by the gravesite. Interesting and timely hub Mel. They just had a hundred year memorial of the disaster in Halifax. Good treatment of this evergreen subject. Some friends just went to the site on a cruise and stopped above where she went down and held a service. Great Article. Can't wait to see the mechanics of the new Titanic. Awesome Mel! I love the Titanic - one of mu daughters is absolutely fascinated with it. She's read a lot about it and seen the movie several times. I wish they would have the exhibit at our Science Center again - I'd love to take her. I took her to see the exhibit for a Pirate ship exhibit and ship wreckage - it was pretty cool. She loved it! I am going to let her read your hub after school I know she will find it really neat! Thanks! It's always been a dream of mine to visit the wreckage of some sunken ship in a submarine. Although the devastating events that caused the Titanic to sink are grim to think about, I really enjoyed reading your hub and dreaming about seeing the submerged remains of such a historical event. It saddens me to think that I would be damaging the ship by visiting it, so it's cool that you added such interesting photos to accompany this well-written hub. Excellent hub, Mel! Voted up, shared, etc. Very cool Hub! Lots of great information on the Titanic's current location and why she remains at the bottom of the ocean. Rated up! Interesting information. I understand that quite a bit of the damage has been caused by site seers. Some of the structural damage was caused when a wedding couple got married on a submarine which landed on the deck (thus crushing it). 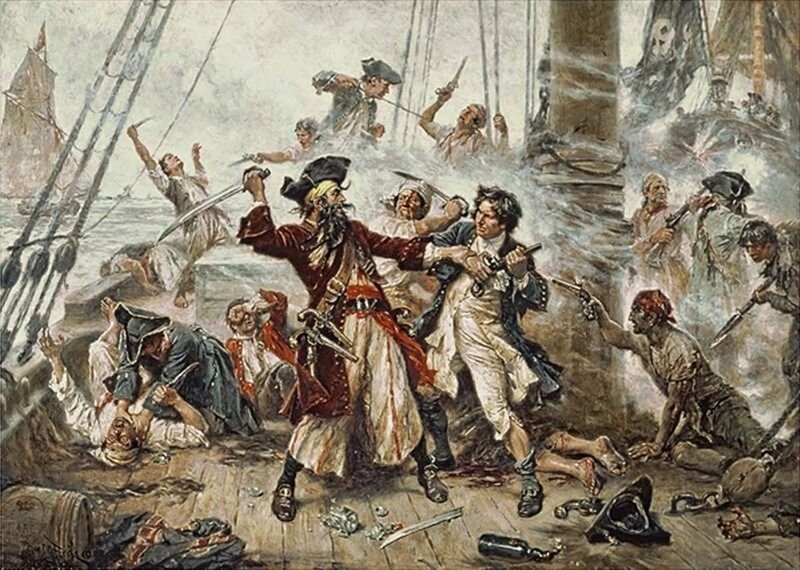 There is a plan afoot to paint the ship with a special type of paint that will help preserve it. PS...did you hear about the rich-assed Australian dude who is building a Titanic II? He announced it today.